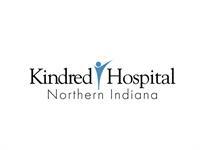 Kindred Hospital Northern Indiana is a 32-bed transitional care hospital conveniently located approximately five miles southeast of South Bend, Indiana, in downtown Mishawaka. We provide intensive long-term acute care to medically complex patients who require extended recovery time. Kindred Hospital Northern Indiana is certified by Medicare, accredited by The Joint Commission, and licensed by the State of Indiana. Kindred Hospitals serve as the bridge for medically complex patients who are unable to recover completely in the traditional short-term acute care setting and require continued care and extended recovery time. Our goal is to help patients grow stronger and more stable before they transfer to a skilled nursing facility, rehabilitation center or home. We use an interdisciplinary team approach to care that helps our patients return to the highest quality of life possible. Services Kindred Hospital provides aggressive, specialized care to patients who need extended hospital stays. Our patients have serious medical conditions, often many at the same time, requiring a coordinated, specialized approach, directed by physicians, to meet their daily medical needs. Nurse Yuko C Offered great nursing and compassion. Nurse Beverly W, one of the best. Nurse Tami C, she was very great. Nurse Linda R, I enjoyed her as well as nurse Christine H, she worked hard. PCP Tijuana, amazing work ethic and compassion. PCP Susan, also went over and above in so many ways. PCP Tiffany, she is so caring meets all my needs. The respiratory team is also great. Denise, Joe, went over and above to make me feel comfortable, to make us feel comfortable. Physical therapy, Christy is such a great therapist, I admire her compassion. Anil is the first male therapist Chris would open eyes to when addressed. He would not open eyes with anyone else. Anil is a great guy! PCP Wanda is a hard-working nursing assistant. EVS staff member Quarentina is also a hard worker. They took great care of Chris. I think all of the staff is very well trained and they have ethics about things. They are professional and try to get to you as fast they can given their work load. I just really liked the staff. I did not care for the food or the seasonings they used in the gravy or the meat. I think that the RN Sheila and the PCP Rita were especially good. They work hard and make sure their patients are taken care of.